Based on monitoring data for the period 2006–2008, five Slovenian marine water bodies were classified as being in a poor chemical state. This state was determined by values that exceeded the environmental standard of the quality of tributyltin compounds, which have been monitored at the level of the European Union since 2007. Three marine water bodies have been determined to be in a good or very good ecological state. In accordance with the Water Directive and national regulations (Rules of monitoring the status of surface water), the chemical (classified into two categories) and ecological (classified into five categories) state of seawater is examined in order to determine its quality. The chemical state is expressed as the concentration of priority and priority hazardous substances in surface water. These substances have been selected due to their widespread use and their increased concentrations in surface water. The ecological state is expressed as the quality of structure and functioning of water ecosystems connected with surface waters. An assessment of the ecological state of surface water is based on identifying the change in values of physical, chemical, biological and hydromorphological elements compared to the reference state, i.e. the state without or with almost no disturbances. As the reference state depends on natural conditions and characteristics, the assessment is based on the ‘type-specific approach’ in which waters are initially classified into ecological types according to natural conditions and characteristics. Due to a change in methodology, the indicator is not directly comparable to the MR06 indicator Chemical and trophic state of the sea, presented in previous years. To achieve favourable chemical and ecological state of water bodies by 2015. To prevent further deterioration of the state of waters, i.e. to protect and improve the water environment. To reduce or gradually eliminate emissions and discharge of priority hazardous substances into surface water through the implementation of special measures. In the period 2006–2008, monitoring of the state of seawater was carried out in 5 water bodies, while the water body Škocjanski zatok will be included in the monitoring programme in future years. The results of the monitoring of concentrations of priority or priority hazardous substances in seawater show excessive concentrations of tributyltin compounds, while other pollutants did not exceed the prescribed environmental quality standard. Therefore, the presence of tributyltin compounds points to poor chemical state and is crucial for the assessment of five marine water bodies, as presented on the map (figure MR06-1). Tributyltin compounds in seawater have been monitored since 2007, when an environmental standard was set for them at the European level. As they are highly toxic, the standard is set at a low concentration (0.2 ng of tributyltin cation/l). The presence of these substances in the sea may be a consequence of their use in the past, since, in the late 1960s and 1970s, TBT was added to paints and coatings as a biocide to prevent attachment of unwanted organisms. Since 2003, its use has been prohibited in EU countries. However, the prohibition does not include military vessels, buoyant auxiliary structures or other ships owned or used by the state for non-commercial purposes. Also, outside the EU, the use of TBT is only limited in Canada, Australia and New Zealand, while elsewhere it is not prohibited. This means that cross-boundary pollution or global maritime traffic may also be a contributor to over pollution of the Slovenian sea. 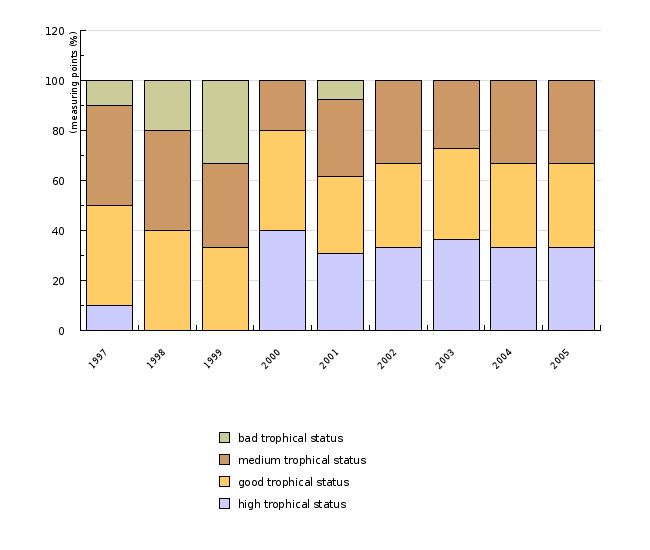 The assessment of the ecological state of marine water bodies according to individual elements of quality on the basis of monitoring data for the period 2006–2008 is presented in table 1. The final assessment categorizing marine water bodies as being in a good or very good state is based on the assessment of 3 biological elements (phytoplankton, macro algae and benthic invertebrates) and a supporting element of nationally relevant substance. It is shown in table 1 and on the map (figure 2). For the water bodies Žusterna – Piran and Lazaret – Ankaran, the final assessment is given without the element of benthic invertebrates, as both water bodies have a type of coast for which the methodology of sampling and evaluation with respect to this element has not yet been developed. The Bay of Koper is a heavily modified water body; the ecological state of such water bodies is assessed by ecological potential, but this potential has not yet been determined.